After a short drive, we arrive for a private picnic lunch with John Jordan at Jordan Vineyards and Winery. The property is located in the hills of Alexander Valley. Forty years ago, on May 25, 1972, Tom and Sally Jordan signed the deed on their first piece of Alexander Valley property, then called Jordan Vineyard. Their son, John was born on the same day. Three-quarters of the 1500 plus acres are dedicated to natural habitat in these rolling hills, oak trees, lakes, streams, vineyards, olive trees, pastures, and gardens. We picnic alongside Jordan Lake—where it is a glorious 72 degrees. Jordan’s executive chef, Todd Knoll packed our basket, which is brimming with Jordan wi nes and fresh fruits, gourmet meats, cheeses, fresh bread, olives, grilled peppers, homemade breads with Jordan Estate Extra Virgin Olive Oil. John shares lunch and his father’s story and original vision of producing world class Cabernet Sauvignon and Chardonnay—along with winemaker Robb Davis’ vision for the future. 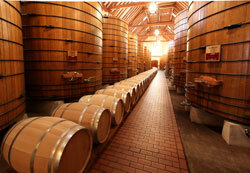 After 30+ vintages each year’s fruit is treated as special as all the vintages before it. Old World artistry is integrated with recent research, and Rob Davis’ hands on experience. After lunch we settle into our fabulous suite—overlooking the barrel room from one balcony and the vineyards from another. Over the next three days on this property I find it difficult to believe that I am in not staying at French chateau in Bordeaux or playing a part in one of my favorite movies, A Good Year. We explore the property to find another lake, where a black swan glides around the water curiously watching us. In the afternoons we take a bottle and relax under the enormous shade tree, on the patio alongside the vineyards. We also take time to re discover lovely Healdsburg. You could not dream up a place more perfect than Healdsburg. 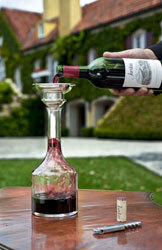 Luxury accommodations include Duchamp, Hotel Healdsburg, Les Mars Hotel, Healdsburg Inn on the Plaza, or Madrona Manor. The small storefronts are filled with wine tasting rooms, divine restaurants—our favorites being Charcuterie and Dry Creek Kitchen—as well as locally owned shops with wares from both local artisans and international designers. 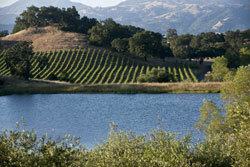 Our last day includes a tasting with Ed Sbragia and a picnic lunch and afternoon on Lake Sonoma. On our scenic drive up Dry Creek Road, we stop to pack the picnic lunch at Dry Creek General Store. We continue on this country road towards Lake Sonoma passing one beautiful vineyard after another, all of which have preserved the natural beauty of th eir property rather than marketing it to tourists. We arrive at Sbragia Family Vineyards, which both adjoins the lake property and offers breathtaking views of Dry Creek Valley. Legendary winemaker, Ed Sbragia, formerly the Wine Master of Beringer Estates in Napa Valley, fulfills his promise to his father, Gino to continue making wine in Dry Creek. We are greeted by “Welcome Jan and Kevin” written on their chalkboard sign. Our trip on Sonoma always includes a visit with Ed and his family. 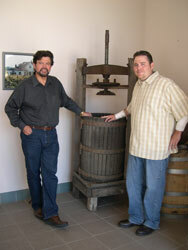 Adam makes the wines with Ed. His son, Kevin works in the cellar during harvest. Adam’s wife, Kathy, runs the hospitality with Ed’s wife, Jane, and daughter, Gina. Saying our goodbyes, we continue over Dry Creek Road onto the bridge at Lake Sonoma and through its winding roads, which boast panoramic and spectacular views—making it one of my most anticipated parts of this annual trip. Created by the construction of Warm Springs Dam in 1983, the lake provides flood control, irrigation and recreation. It has a surface area of more than 2,700 acres and 50 miles of shoreline. The only thing better than a drive over Lake Sonoma is exploring the lake in a speedboat with our gourmet picnic of Coppa and Soppressata sandwiches, deviled eggs, and wood oven roasted seasonal vegetables, and Bomboloni—Italian baked doughnuts—a sweet ending to our Sonoma escape.